Photo: IBM 650 Manual; CLICK to magnify. The bank of buttons across the top is used to control power to the machine. The black items are buttons, the light items are indicator lights. Below the power control is a row of lights for displaying ten decimal digits and a sign, ten columns 7 lights each for ten digits, plus 2 lights for the sign. Each column has two lights on top; the left one indicates 0, the right one 5. The five vertical lights below indicate the number, 0-4, to be added to base indicated by the top lights, thus allowing all digits 0-9 to be displayed by 7 lamps. Since the top two lights are binary (base 2) and the ones below it "quinary" (base 5), this is called a bi-quinary display. The rightmost column of 2 lights indicates the sign, + (top) or - (bottom). Then comes a row of knobs marked Storage Entry, used for entering decimal digits into any desired location. The rightmost knob selects the sign. 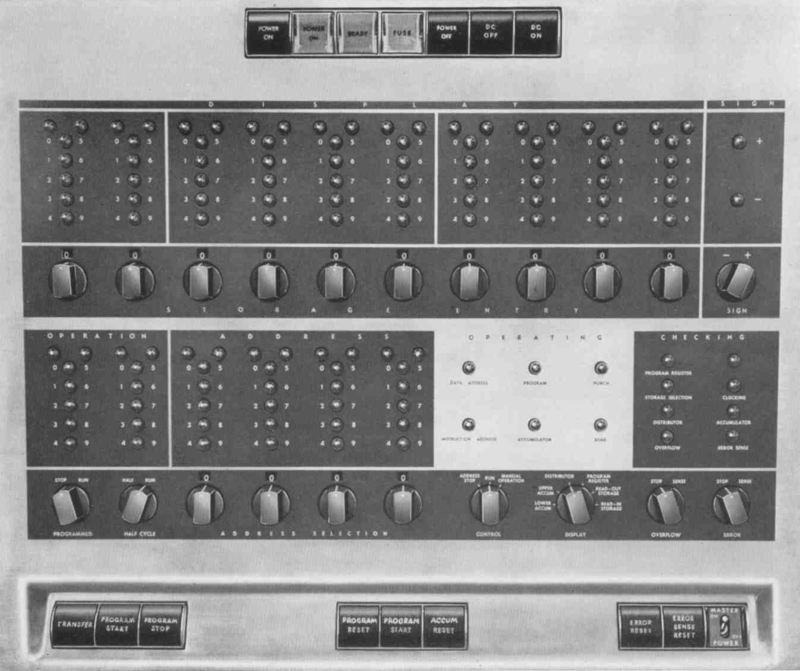 Type 650 Magnetic Drum Data-Processing Machine - Manual of Operation , first revision, Form 22-6060-1, IBM, 590 Madison Avenue, New York 22, NY (June 1955), pp.47-57. 1953).